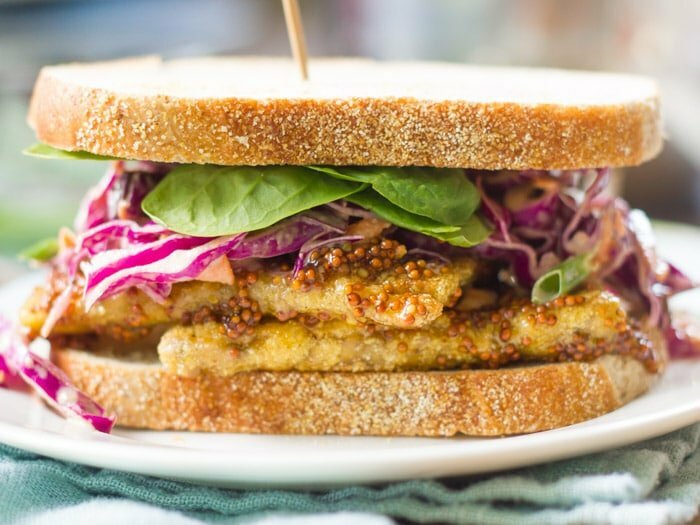 Crispy cornmeal crusted tempeh is drenched in sweet maple-Dijon sauce and stuffed into toasty bread with wasabi slaw to make these satisfying and scrumptious vegan tempeh sandwiches. This was such a good sandwich, and totally not my idea. Well, the tempeh wasn’t my idea, but putting it on a sandwich was. The tempeh is kind of the best part though…it’s all crispy cornmeal coated and drenched in sweet maple-Dijon sauce, which is so simple, but pretty darn incredible. I had tempeh prepared this way when I visited a new (to me) vegan restaurant a few weeks ago. I know you guys love restaurant recommendations, so if you’re in the southeastern Pennsylvania area, definitely check out Sprig and Vine in New Hope. I went there with my family and I think between the lot of us, we managed to order one of everything on the menu. It was all delicious. I ordered cornmeal crusted tempeh, which was pretty close to the tempeh you see in this sandwich, but served as a platter with horseradish sauce. So good. 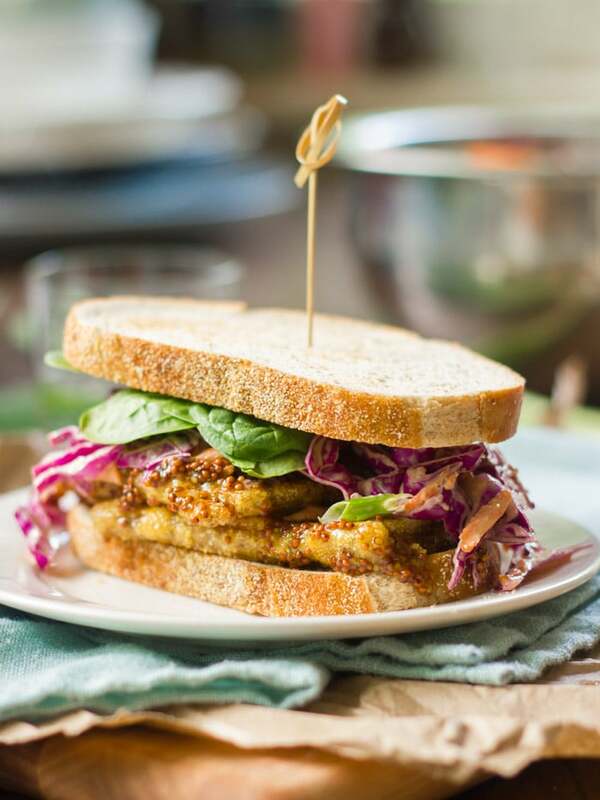 I decided to snag the idea, but I stuffed mine into some bread and made tempeh sandwiches, with wasabi slaw. I tried something new when I made this: for the binder, I used aquafaba (chickea brine for the uninitiated. Really.) It worked great! I didn’t feel like waiting for a flax egg to gel, so I just went and cracked open a can of chickepas and voila, tempeh is ready for dipping. Just to confirm that the use of chickpea brine actually does something, I did a side-by side test with some almond milk. Almond milk worked okay, but aquafaba was way better. You can use whatever milk or a flax egg if that’s what you’ve got on hand. 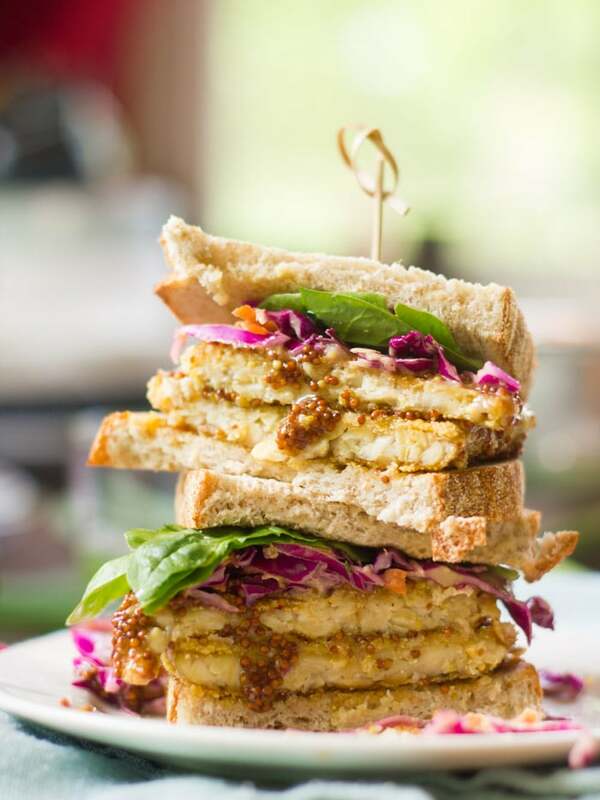 Crispy cornmeal crusted tempeh is drenched in sweet maple-Dijon sauce and stuffed into toasty bread with wasabi slaw to make these satisfying and scrumptious vegan sandwiches. Stir all ingredients for the wasabi slaw together in a medium bowl. Set aside. Stir maple syrup and Dijon mustard together in a small bowl. Set aside. Slice the tempeh in half, width-wise (or in thirds, if you want to make 3 sadnwiches), then slice each piece in half, thickness wise. Stir cornmeal, salt and pepper together in a shallow dish. Pour aquafaba into a separate shallow dish. Coat the bottom of a large nonstick skillet with oil and place over medium heat. Dip a piece of tempeh into aquafaba, flip and dip the other side, so it's fully coated. Dip each side in cornmeal mixture and then place into the skillet. Repeat for as many pieces of tempeh as you can fit into the skillet. Cook until crispy and lightly browned on bottoms, about 5 minutes. Flip and cook until crispy and browned on opposite sides, about 5 minutes more. Transfer to a paper-towel-lined plate. Repeat until all tempeh pieces are cooked, adding oil to the skillet as needed between batches. Dip both sides of each tempeh slab into maple-Dijon sauce before stuffing between a pair of bread slices. Top with slaw and greens, if desired. Optionally, drizzle with additional maple-Dijon sauce. Serve. This recipe makes plenty of slaw and sauce. Use as much as you like of each. Thanks so much Emilie! Tempeh is one of my all-time favorites too! Hi Alissa, nice to find you’re website. Thanks for share a great article, can be an inspiration. 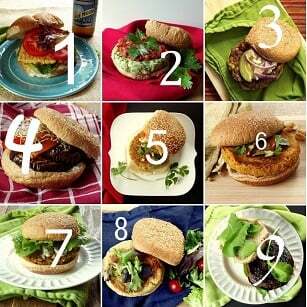 This looks yummy, but I haven’t worked much with tempeh. Do you have to steam it to get out the bitterness? Woo looks delicious.. I think my childreen will love it. Will try it after get home.. Thank you! I hope you all enjoy it! Seriously, that picture tell a lot. and it sure looks delicious.. I think my husband and my children will lovethis. Thanks for sharing. Will try it after get home..
Was going through your archives and found this recipe! Made it for brunch and it was so yummy! I am not a fan of wasabi so I did not add it to the coleslaw.